It’s been a great winter so far, or a long one — possibly depending on how many hours you’ve spent handling your snow shovel or driving through slush and snow. Even snow days have become part of the school routine for our kids, and therefore — shockingly — boring. Luckily, we’re involved in a program that takes perfect advantage of all this, well, winter — and takes care of the boredom, too. The program is called Passport to Winter Fun. It’s a winter-long program for elementary-school-age children created by the Upper Valley Trails Alliance, which serves communities in Vermont and New Hampshire. The basic idea behind Passport to Winter Fun is to encourage children — and their parents, too — to have fun outside “even” in the winter. Virgil received his passport book from his third-grade teacher a few weeks ago. The book gives simple instructions for documenting the number of days he spends at least 60 minutes being active (outdoors or indoors) between now and the middle of March. Once he’s filled in 10 boxes, he gets to call himself a Snowshoe Hare; after 20 boxes, he’s a Winter Fox; and after he’s filled in 30 boxes, he becomes a Polar Bear. The folks who put the program together clearly know kids. The passport book has no glossy photos, just line drawings of various northern animals having winter fun — a moose on skis, a squirrel on skates, a goose on snowshoes. But I notice, watching Virgil, how it keeps him interested. Each box is big enough for him to write a short description of his outdoor activity; a small star in each box also lets him fill in days when he shared his activity with a family member. Not surprisingly, that’s motivated him to think about ways to get the rest of us outdoors, too. Virgil’s motivation gets a big assist from a list of prizes, all donated by area businesses, that he can claim after hitting his 10-, 20-, and 30-day marks, and by a Grand Prize that all 30-day Polar Bears can enter a drawing to win. The Grand Prize, Virgil tells me, is an iPod shuffle. Very motivational. Coming up: Information on other Winter Fun programs around the AMC region. 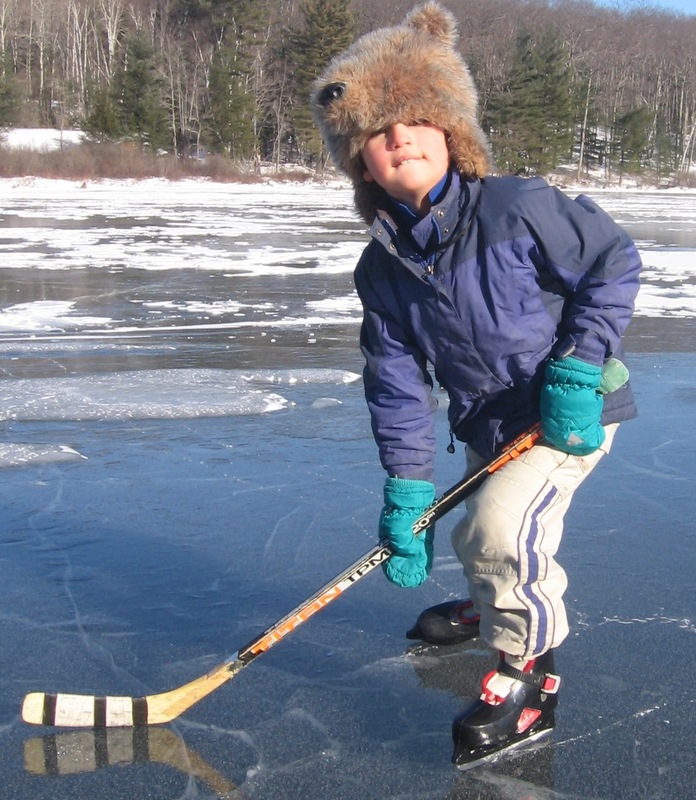 • Go to the Passport to Winter Fun page on the Upper Valley Trail Alliance (UVTA) website. UVTA also helps other communities start their own Winter Fun programs. • Read about the Robert Wood Johnson Foundation program, Active Living by Design, and its work with UVTA.